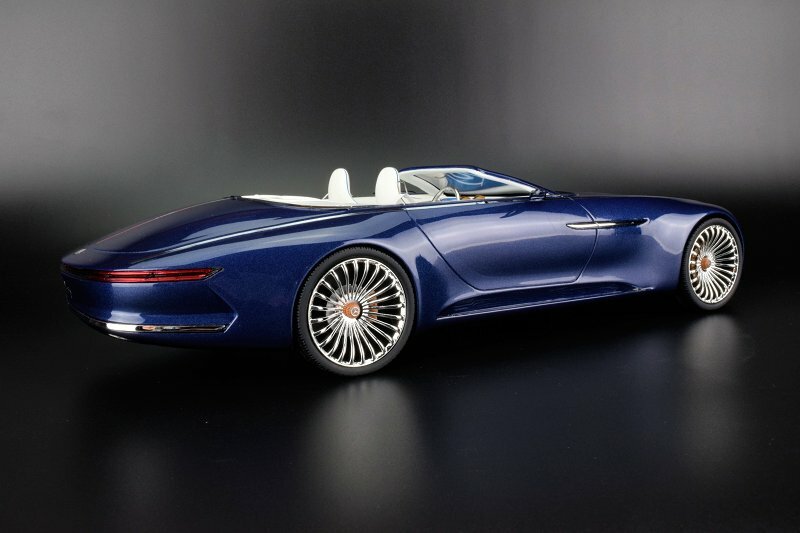 Out all the concept cars that arrived in the last little while the Mercedes-Maybach Vision 6 Cabriolet in our opinion is one of the best and sexiest of the lot. 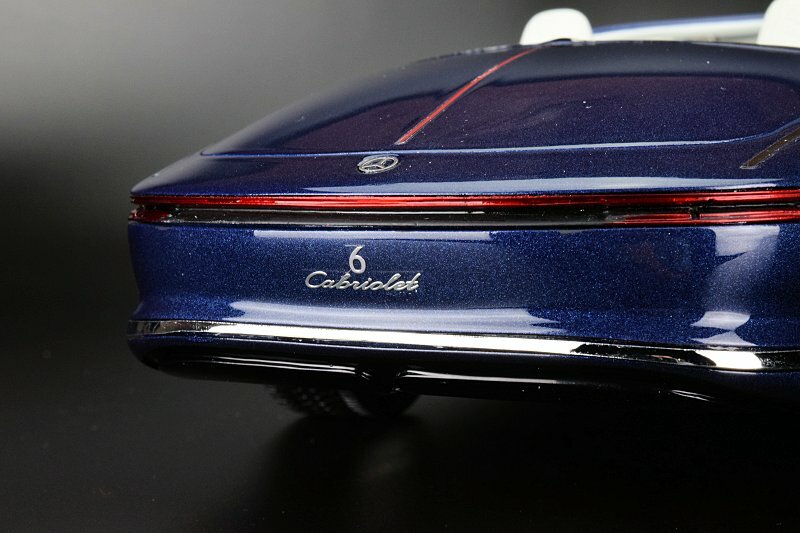 It debuted at the Monterey Car Week, Monterey Peninsula, California in August 2017. This is an electric car, the drive system has an output of 550 kW (750 PS), battery life allows a range of over 500 kilometres. Not too shabby for a boat of this grand scale. 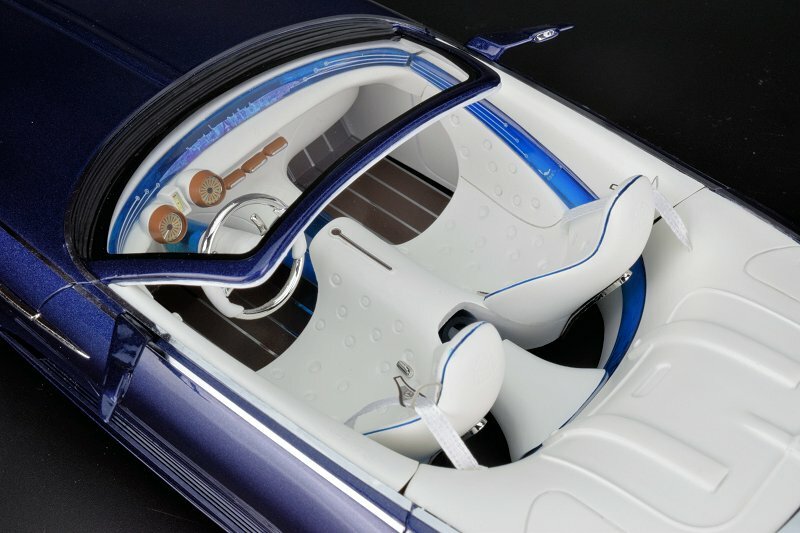 The interior is quite unique with transparent Blue luminescent lighting with internal White. It definitely inspires emotion. 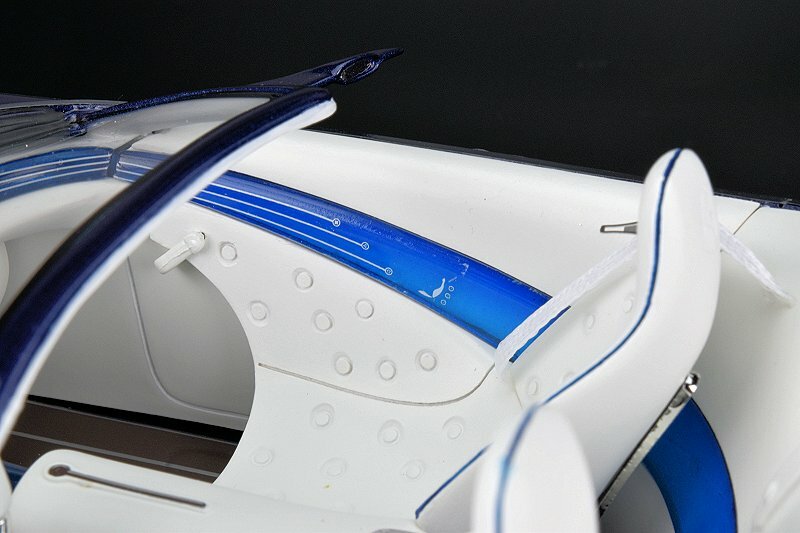 The model here in scale was developed by Schuco, under this resin/sealed series called Pro.R.18. 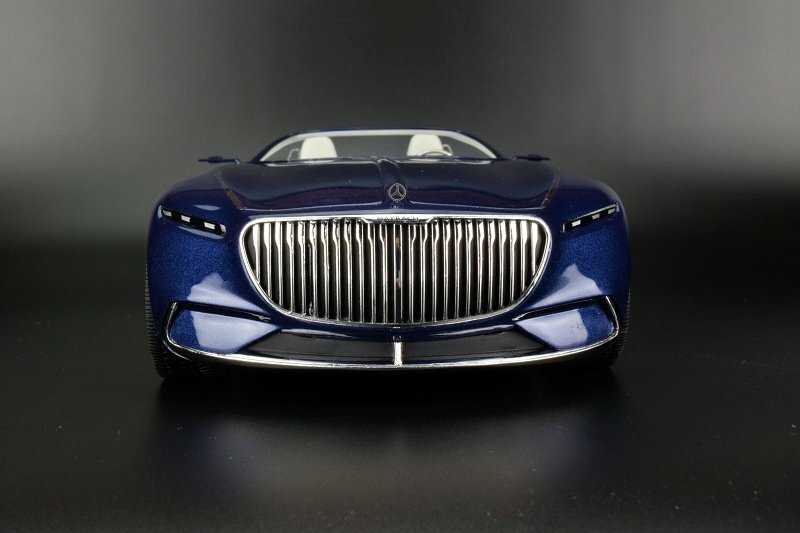 It is also available in Coupe form, each we believe limited to 500 pieces. This is a first for our team from the Pro.R.18 series. I think we all know how good Schuco is with traditional diecast metal. Are they as good with resin? 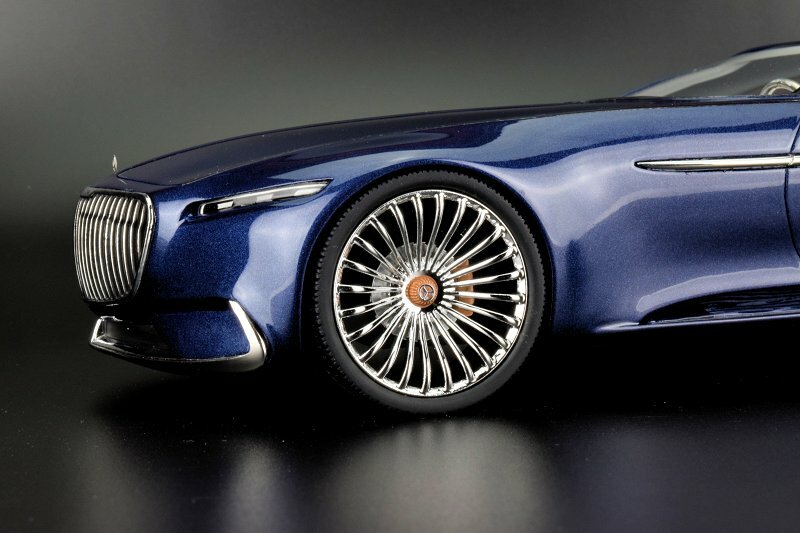 If you’ve seen prior photos of this concept you already know how breathing the overall exterior styling is. As for paint, it’s on par with other brands of higher or lower price point. Our example had no issue with the Blue exterior paint. 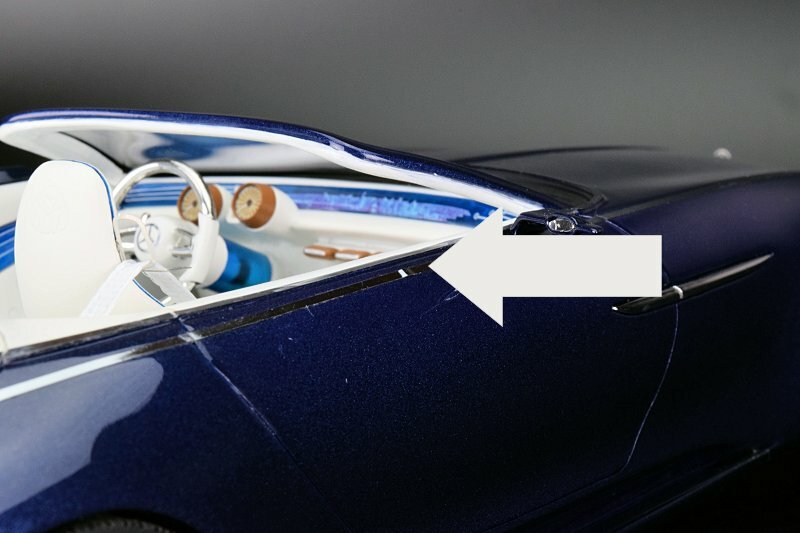 What we don’t get with the Schuco model is a separate option for the roof. The model ships without any secondary piece. No biggie. On the flip side, there has been much talk about the poor execution of photo-etched pin stripping, and there is much on this example. Prior to shipping our specimen, we requested the model be inspected in detail. It was reported back a “have just checked and the model is without any issues”. Well, not exactly. 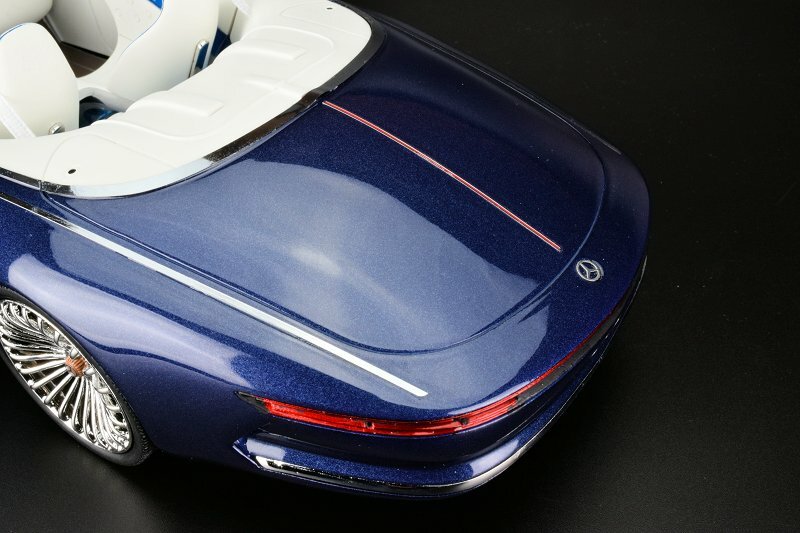 Our model did have issues; front driver side and passenger door centre in fact. At first, we massaged the strip back into position, though a week later when we took the model out for the photo shoot these areas we raised again. Is there a perfect example out there, we’re not too sure. The best part is, the model on the provided box is showing the same issue with the pin stripping too. Go figure! The shop of purchase will remain nameless. Hopefully, an amicable resolution can be reached. 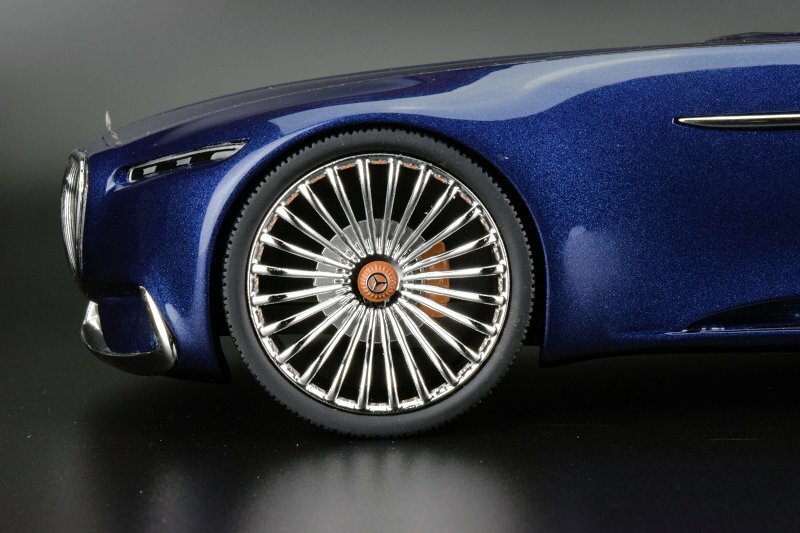 Something that has plagued resin models, in general, is the curing cycle or possible assembly is how well they sit flat and how well each tire touches the ground. Our example isn’t perfect, a slight 2mm rise in the front passenger side. As for the overall shape and design, we will give Schuco good marks for execution here. As noted this is a sealed resin piece. Panel gaps and shutlines are excellent. A shame Schuco did not develop this one in diecast metal with opening parts, the centre hinged two-part hood would have been something marvellous! Something that was missed and noted by another user is the missing chrome work on the running boards, driver and passenger side. I doubt this was an honest miss by Schuco. We’d love to hear their side of the story here. 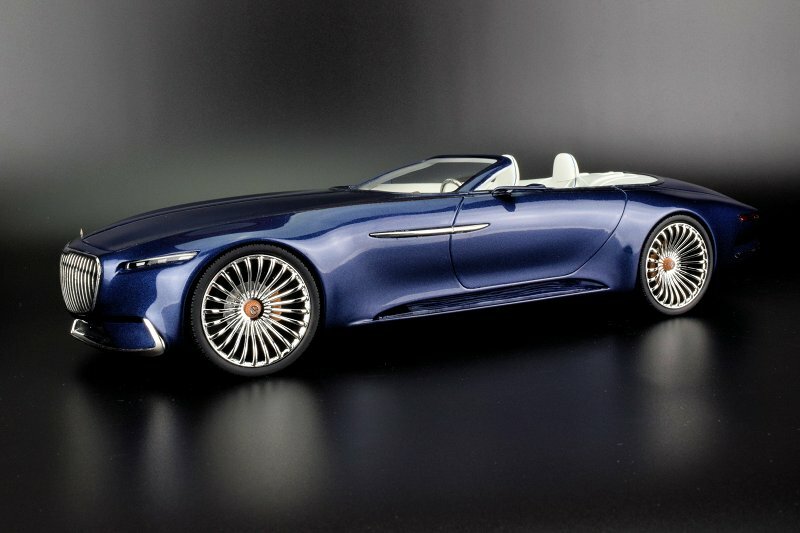 No matter what angle you look at the Mercedes-Maybach Vision 6 Cabriolet it looks on point. The front is forged with a large grille finished in chrome. Small slots right and left are the headlights, such a beautiful design. Lower chin spoiler perimeter is surrounded in chrome. 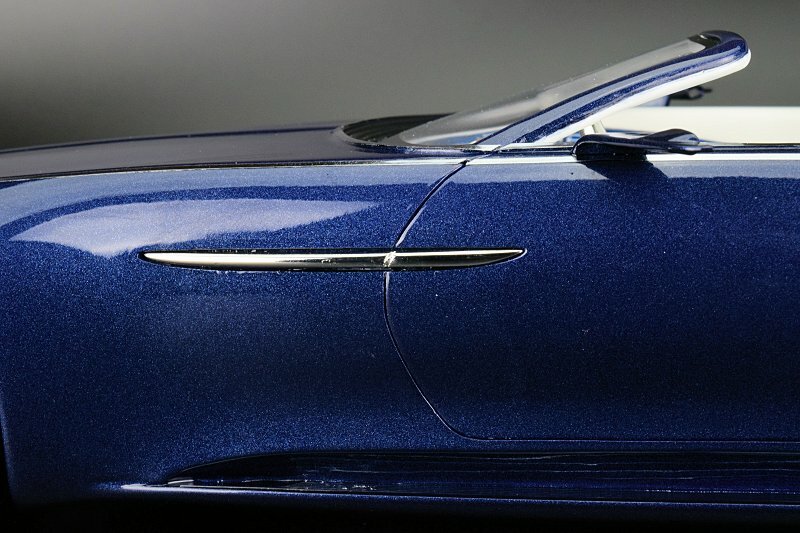 With all this chrome one would think the execution would be solid, however, the execution is quite poor. 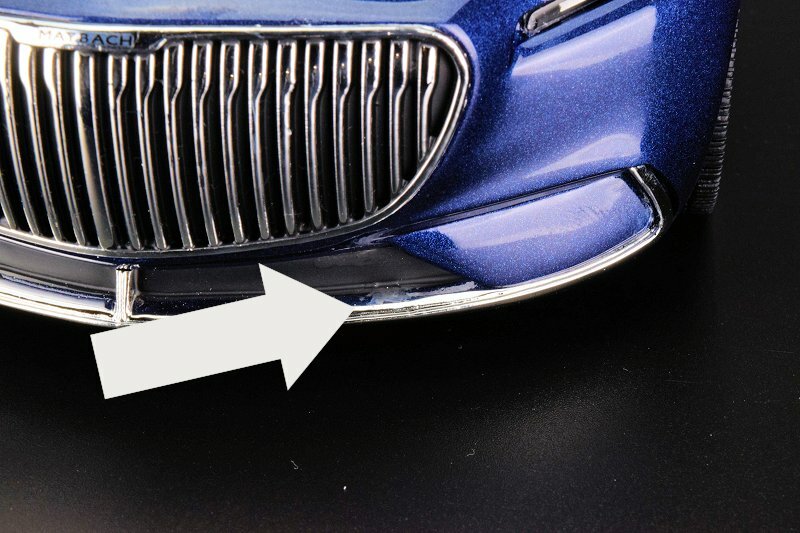 Grille has little flaking around various parts of the perimeter and so does the chin spoiler, the ladder is the worst of the two. See photo. A little more finesse or quality control could have provided better results. 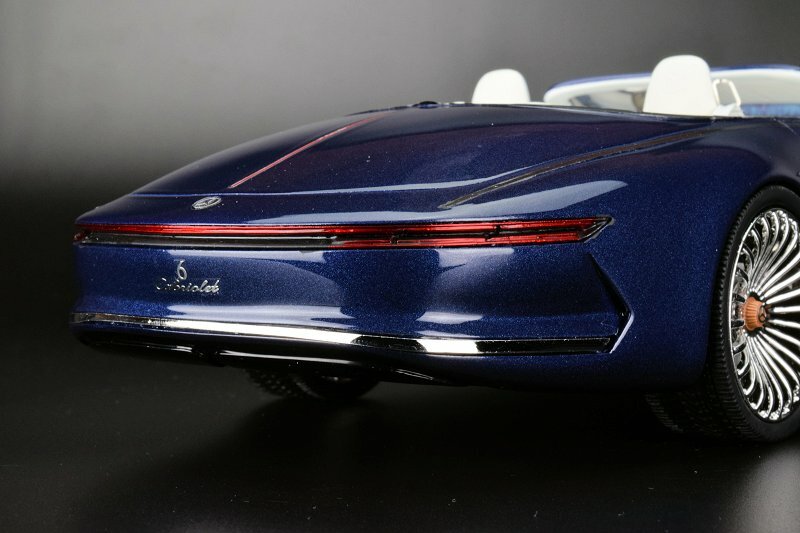 The rear is simple and somewhat elongated in design. Chrome work here is definitely better. Nice execution of the wrapped Red taillight and centre decal. 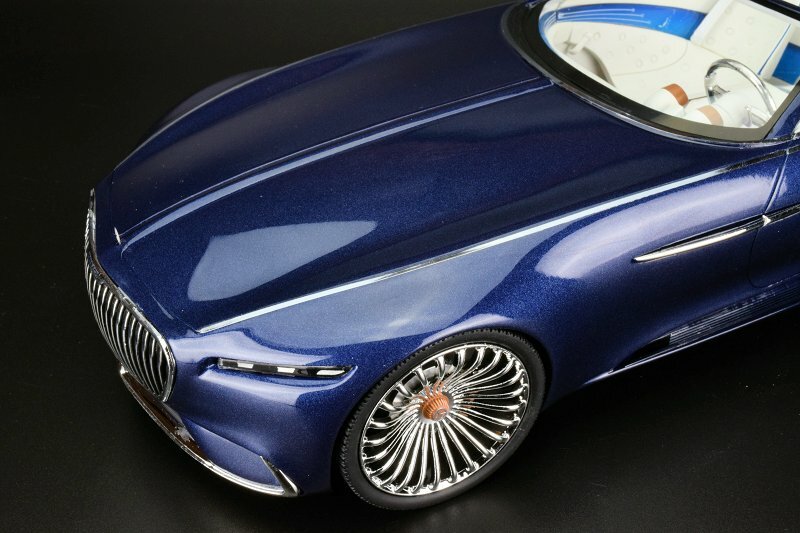 Wheels on the Mercedes-Maybach Vision 6 Cabriolet are massive, to say the least. 22-24″ rollers are finished in chrome. Front are not steerable but all four are capable of spinning. The centre of the wheel features a Brown/Redish-like cap with MB logo attached. In behind the rotors are found as solid metal and the calipers are Gold/Brown in colour. Based on the images we studied these are possibly incorrect. How? First, the rotors we believe should be cross-drilled and the scale of the calipers front and rear seem to be off. It is possible the model used by Schuco presented a different scenario; this is feasible based on the concept study. 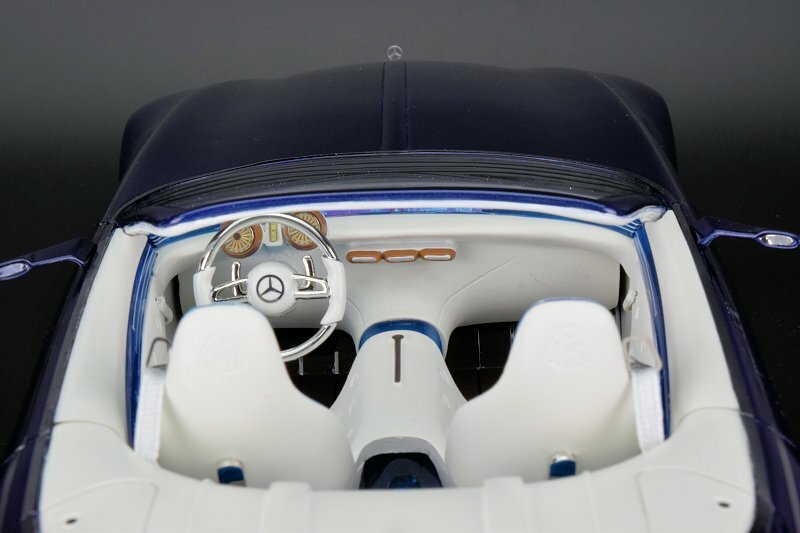 The main reason we went with the Cabriolet over the Coupe was the interior. The White on Blue looks spectacular from far and up close. 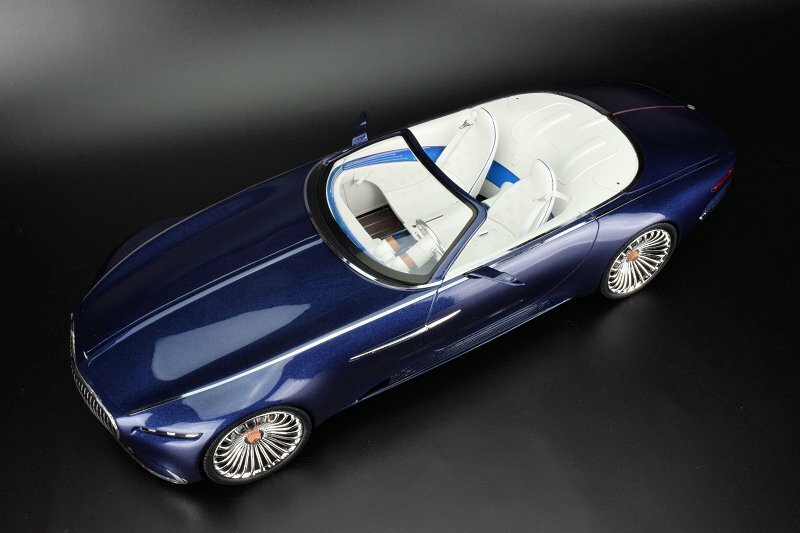 If you haven’t seen the photos of this concept lit up do yourself a favour and Google the images! Good marks for Schuco of capturing the emotion and styling of the design on a whole. The Blue elements are transparent in design and look rather cool under a beam of light. 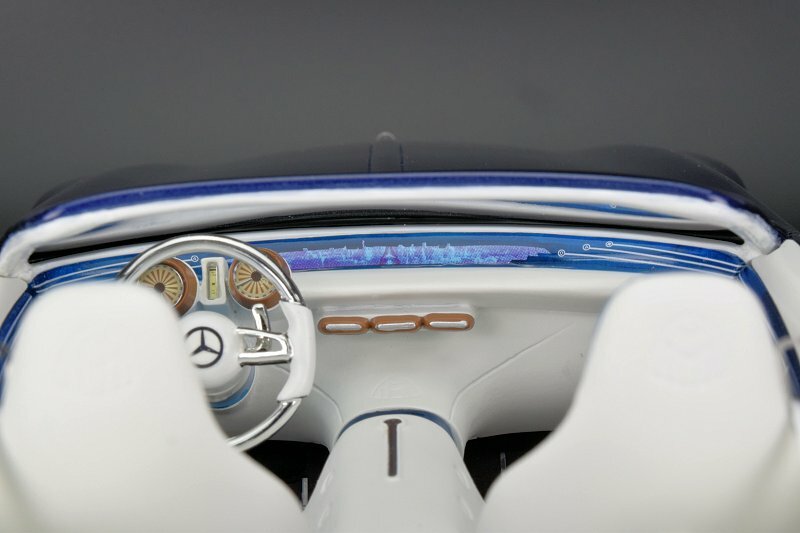 Nice work on the dash and related elements do provide a visible delight. 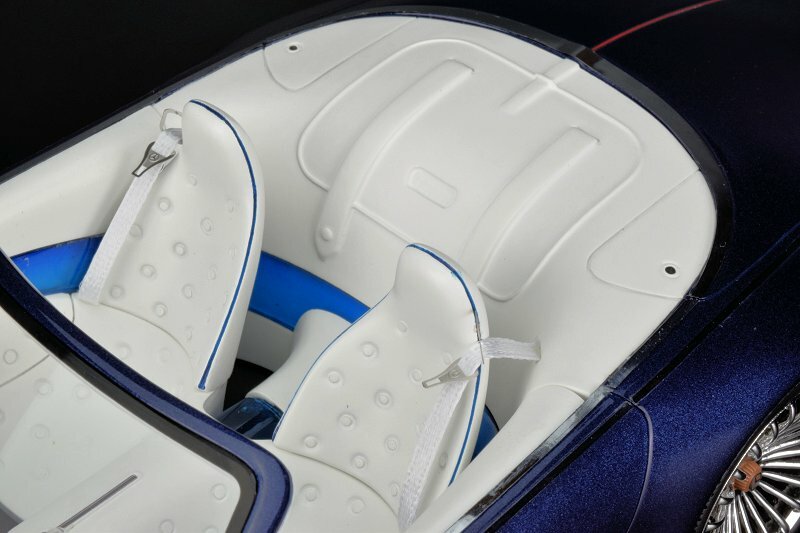 The model also features fabric seat-belts with metal buckles. Two thumbs up to Schuco for providing a metal guide on each headrest, though they should have been slightly thicker to mirror the original. Overall an excellent effort. Likely our favourite bit of the model on a whole. 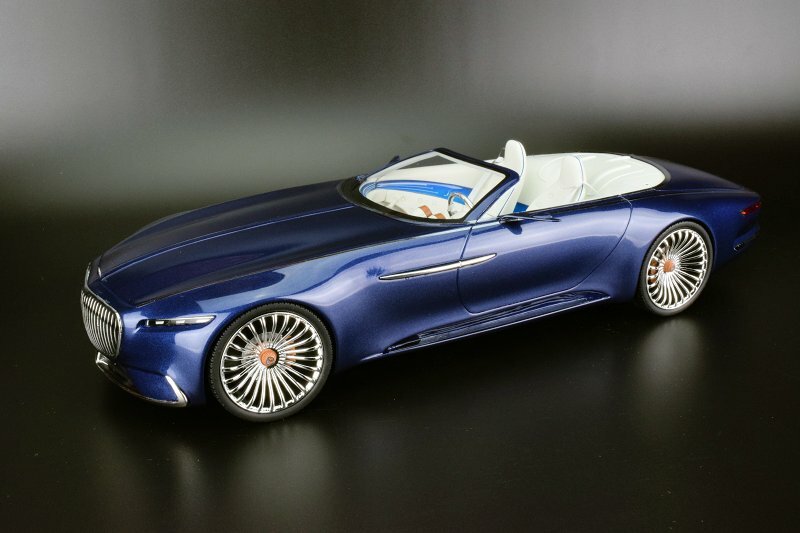 We have mix emotions with the Mercedes-Maybach Vision 6 Cabriolet by Schuco. We cringe at the unsightly lifts within the pin stripping. This is likely due to OCD and our fondness of the concept itself. Being priced above the average GT Spirit piece, and regarded by them as “Pro” one would expect a near perfect piece. This is not so. We hear the model itself is nearly sold out so the vultures will definitely come to play, pricing this piece well beyond a fair price based on what is presented as a final production piece by Schuco. The paint and interior are well done we’ll give them that. If one is collector of concepts this one is a must-have. We don’t think you’ll see this done in 1:18 scale again. 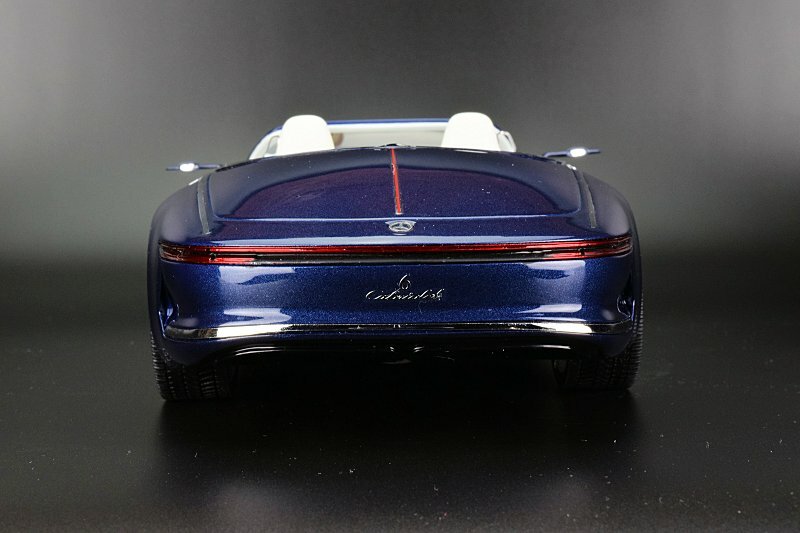 Though we had planned to add the Coupe version that has been placed on hold until further notice. Enjoy the pics! 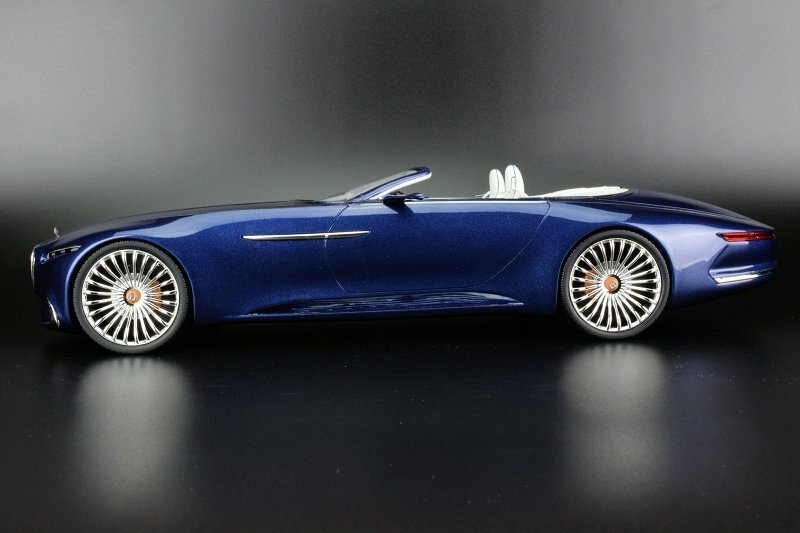 9 Responses to "REVIEW: Schuco Mercedes-Maybach Vision 6 Cabriolet"
Thank you for the review, now I’m glad that I cancelled my order for this. Well, the deal breaker for me were the missing chrome trims along the side running boards, but with the other issues stated here, that would also drive my OCD crazy. We missed that! Edit the review to now mention. We’d love to hear their excuse here. Wow! 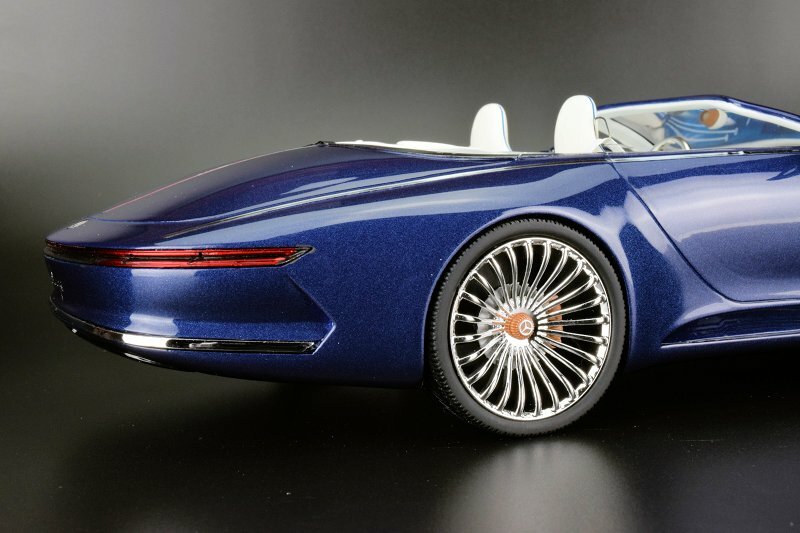 Stunning concept car!! I much prefer this cabriolet to the coupe. But why such a huge grille on an electric car? Thank you for the review. I considered buying this (over the coupé) but refrained from pre-ordering it. Glad I didn´t. 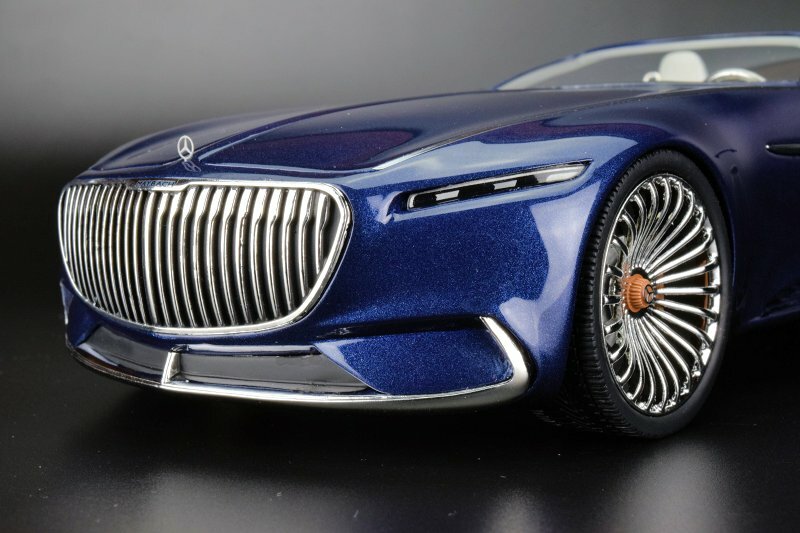 I will put in my two cents worth in seeing how this was the only site I could find that would give me a chance to leave a review on Schuco’s 1/18 Mercedes Maybach Vision 6 Coupe’ (Dk. Red) I bought this on eBay a few days back.The seller is not willing to give me a refund but said he would refund me $25 ..I haven’t seen as of yet…My reason is because of the ripple pinstripes and wavy front windshield with a flat spot.Some of the side windows are also coming loose.It was sold as new in box. It seems both cab and coupe are riddled with issues. I can tell from experience their diecast metal stuff is much better!